We use the arts to help young people be creative, make friends and express themselves. We have painting, theatre and music to help the young people overcome language barriers, have fun, laugh together and reflect on what’s going on. The young people take part in spectacular opening and closing ceremonies and can join in a daily programme of arts. They will also learn more about the host country by taking part in activities with local communities, like music and art, and visiting historical and cultural landmarks. The iconic image of the Street Child World Cup Rio 2014 will forever be filled with emotion and significance. Artist Joel Bergner led a team of arts volunteers and the young people themselves, to create a 30ft mural on the side of one of the pitches. Made up of hexagons, the mural featured portraits of three children; Gopinath from India, Ilsi from El Salvador, both of whom played in Rio, and Rodrigo (far left) who would have represented Brazil, but was tragically murdered on the streets just weeks before the tournament. 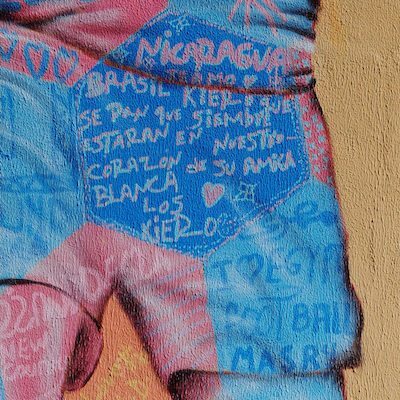 All the teams played football in front of the mural and dedicated their goals celebrations to Rodrigo’s memory, regardless of what country they were representing. The mural leaves a physical legacy to Brazil symbolising hope and togetherness. "This is an expression from my heart: I will always remember this place and now it will always remember me." In 2015, we took over an iconic wall in East of London to promote street children’s rights. Once again, Joel Bergner led a team of volunteers and young people to create a huge mural to raise awareness for street children worldwide. “I am Somebody” mural created in London 2015. In 2014, we teamed up with London-based Hospital Records to produce, “I am Somebody”, the official anthem of the Rio Street Child World Cup. The song became a rallying cry for the young people who took part, and was heard across the world. After the Street Child World Cup Rio 2014, we worked with the London International Festival of Theatre (LIFT) to produce Turfed. Brazilian director, Renato Rocha’s piece explored how football can bring unity and a sense of belonging to young people who have experienced homelessness. We invited two young people, Crystal and Sadock, who took part in 2014 to join the cast. We’ve teamed up with UK school children to break two drumming world records in support of street children. Funded by the Arts Council and delivered in partnership with Inspire-works, our World’s Largest Samba Band at the Royal Albert Hall and World’s Largest Drumming Lesson at the Copperbox Arena Olympic Park challenges have made school children more aware of the situation for other children around the world.